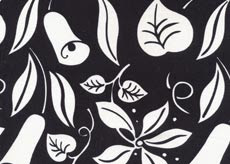 Black and white prints are a perennial favorite of mine, and these "night blooms" will add a graphic touch to your day. This print was painted with a black gouache and I had a wonderful time painting this. Can you picture this as a wallpaper, lining a wall in an entry or a powder room? Black and white are palette cleansers, bold and timeless. Feeling crabby? 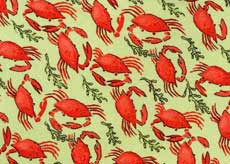 Then how about a crab print! The beach is one of my favorite spots for inspiration, from the sand, the water, the salty air and then there's the crab. 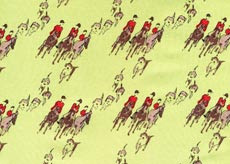 I can see this print as a tie worn with a lovely cotton poplin jacket and lightweight trousers with a bright loafer. Are you still feeling crabby, if not, let me know what kind of print would make you happy! The joy of designing a print, first identifying the motif and then the repeat. One single item, placed, flipped, flopped all in a row forms a happy pattern. Prints have always provided whimsy to me. I love a great print tie, a sash or a scarf. It can add zest to an all solid ensemble. 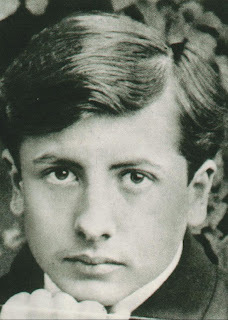 The french always have a certain saviour faire - a little print tucked into a pocket or tied with a non-chalant touch. 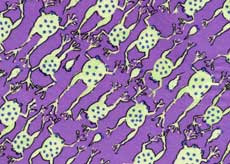 I can take a frog and turn it into a "prints charming" tout suite! Sport a silk print and feel the charm. 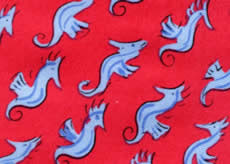 These prints were produced on silk twill for ties fit for a Prince. 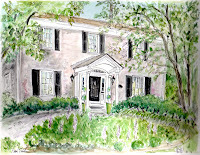 Clients love to have their "home" illustrated as a special memento, to give as a gift. I enjoy doing these as each one is unique and always holds a special place in the heart. This home happens to be located in the heartland of America. 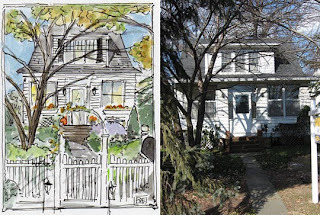 I hope to illustrate many more homes be it your castle, chateau or even a love shack! Through the woods and over the rainbow, a magical spot exits. "Barneche" is literally right off the yellow brick road - a small shop is home to Stephanie Barnes. Her native Kansas hospitality provides warmth and inspiration even on the coldest day. "May I offer you a cup of tea and some fresh baked goodies" - she cheerfully offers, while your eyes feast on a gentler, kinder time. Antiques, hand-made reversible jackets, dolls with soul, glassware, objects found and restored all with tender loving care displayed in wooden items made to set a soulful stage. Ms.Barnes did not need to ask the Oz for a brain, courage or a heart as she has what all artists covet and that is finding one's own strength. She and her husband David Seche are the creative spark beind this shop as well as running a business in vintage electrical lighting. 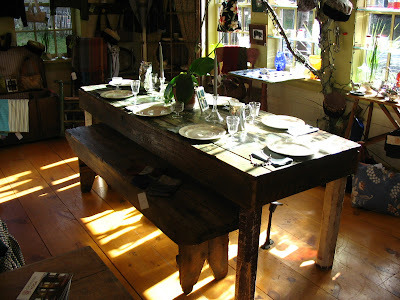 The name Barnes and Seche wired to create "Barneche Design" and the light is a sparkling bright spot in the town of Chichester, NY in the Catskills. 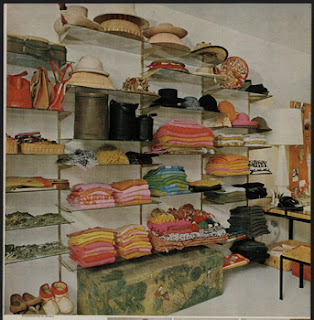 There is an arranged order to the tiny, tidy shop, colorful spools of thread, fabrics folded as if they were origami. Vintage cigar boxes stacked like books. A certain "feng shui" of finding health and happiness at home and work is in the air. 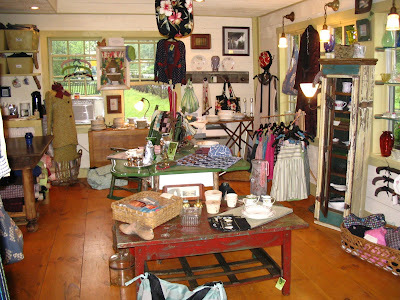 Stop by and you will appreciate all the goodness and the natural setting is one of which dreams are made of. One cannot help but skip out of the shop with a smile and something to brag about to Auntie. 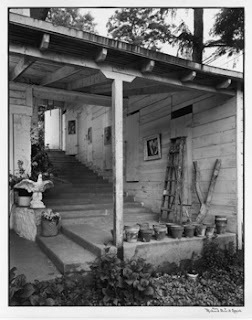 I found satisfaction in knowing that Ms.Barnes had found her place creating a simply artful life. 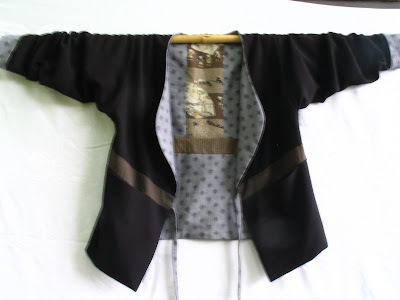 A lovely jacket for you! Friday is a day for shopping for many, preparing for the weekend and any events that it might entail from parties to travels or simply relaxing in the confounds of one's own abode. This year, I thought it might be nice to try and streamline my life, not necessarily "down-size" but to lead a life with a frugal approach. One of my favorite reads is "Walden" - not that I am ready to live in the woods in a cabin but seriously what does it take to make one truly chic and happy. It is a blend of having something new but not spending every cent, like that trip to the five and dime for a new little sparkly treasure. 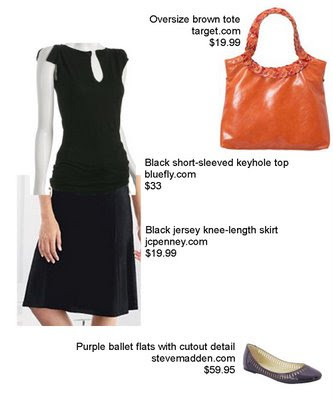 One blog that I look to for saving me pennies is the frugal-fashionista. Cleverly posted idols flanked by similar goods all for lots less, now that is simply worth saving for. I admire those that can stretch the almighty dollar and still look like a million bucks. Every Winter, Birds with a penchant for Antiques flock together at the Armory on Park Avenue in New York City which benefits the East Side Housing settlement. 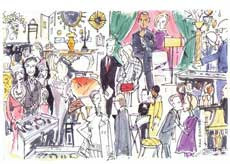 The Winter Antiques Show opened last week and many exhibits were set to display a vast array of American, and European Antiques. Many articles leading up to this high society exhibit tout that you must bring one million dollars. I did not get down to the show but wanted to share this illustration that I had done a few years ago which to me sums up the people milling about as they ponder ways to drop a quick George Apparently there were many items that peaked curiosity and George Washington was one. Every item that makes it to this exhibition must be deemed authentic by the "vetting" community, a tasting committee if you will. Now that's something I could sink my teeth into. I refer to my life in phases and during the before children phase, many a weekend were spent perusing New York City for Antiques and collectibles that could fill my apartment. Budget and item in mind, each purchase was like hunting for a rare and exotic beast. The thrill was educating my eye and my husband will always say, "I know what I like, but she finds things that are real and valuable, she has a good eye." Returning one afternoon with a brown bag full of Royal Copenhagen "full lace" china all for under a hundred dollars. Where was the vetting committee for those items. A round marble top table hoisted into a New York City Taxi is a fond memory. A inlay mahogany table blackened by lack of care, carried home with one less vote and then was later declared that his vote was the one who spotted it first. Lost sleep over items that got away or I clearly knew would not fit that months budget, at least if I wanted to eat. Who cares about food when you can have an antique. Educate your eye to things you know nothing about and then get to know them, it is after all simply a matter of taste. As my mother will always say, "Now, how do you know you won't like it if you don't at least give it a taste." My mother always wanted "twins" even after having a tribe of seven, she still always thought about what it would be like to raise twins. She had to wait for her daughter, (that would be me) to have twin sons. I'd of course never given it a thought but now they are my son(s) and my moon. As infants, they had a special bond and that bond seems to have only gotten better, aged like a solid vintage. A strong blend of bold, oaky, and at times a bit of a fruity essence permeates their teenage selves. Side by side they experience life as partners, as brothers as twins. Each one beats to his own drum, yet listening closely to that of his twin. They often finish each others sentence never missing a beat. Most of all, they have each other to amuse, encourage and to poke fun at . Now that sounds like a perfect partnership. I now see why my mother wondered what it would be like to have twins. This painting by Maurice van Essche, made me think of twins, and then of laundry. These ladies in the painting look as if they could be twins and have stopped to have a chat with these wash baskets confidently perched upon their heads. One can only imagine what they are saying. Could they possibly be talking tribal twin talk or comparing soap? So many great painters elevated everyday tasks to make the ordinary seem twice as nice. One of my sons came home when he was in 1st grade and proceeded to ask, "Mommy, am I related to van Gogh" - well, you do have red hair, but sorry son, no. 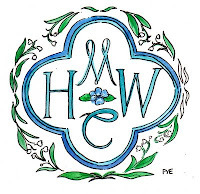 But one relative in my husbands family was quite the painter in the 1900's. Maurice van Essche was born in Belgium, but moved to South Africa after the war and he had the great fortune to study under Matisse. The story goes that they met in the Art supply shop in Nice, France. Both artists were after the same tube of "jaune citron" oil paint, which Matisse had just bought. Being the perfect gentleman, Matisse graciously invited Maurice to come and paint and share his paint. Paint they did. 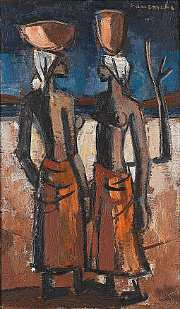 Maurice painted still lives, and tribal images, he used rich color in a modern way. The shapes are strong and painted in a graphic way. He too learned to paint like Matisse in a classical studio setting but they both agreed that freedom of expression was found in painting clean and simple shapes, bold colors and a love for nature. While visiting the Matisse Museum, I could only imagine what fun they must have had sharing paint. Next time you make a trip to your art supply store, pay close attention to who is shopping next to you. One always asks, Is everyone in your family talented? I reply, why yes, silly. I always thought that every family possessed the rare and unique artistic genes. Lucky for me that my mother never allowed any of us to be bored. We were always doing, making, baking, playing. Each of us inherited unique qualities to take with us when we left the nest, never realizing that we were the lucky ones. Big sister inherited the gift of literature and has a way with words, recipes and paint. She is a mother and I liken her to the female equivalent of Gandhi. My eldest sister is the mecca, a voice of calm and a leader of my people. She takes care of many a family crisis and is there for any disaster. She still makes time to paint, bake, sing, care, love, mend, mother, wife, and sister me. 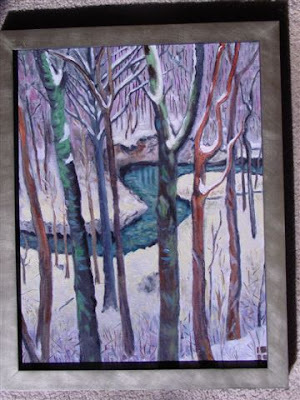 I thought I would post one of her lively paintings here, titled "Snowy Valley." I love the way the trees are strong vertical players and the stream is the horizontal flow. If you look closely, the stream is moving. The strong blue casted colors provide a chilled light, warmed by the red of the trees and I imagine day will swiftly turn to night. The brushed silver frame adds to the wintry mix and this is the perfect painting to bring cool to your home. 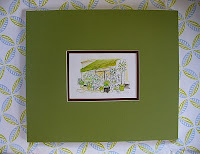 I will be posting more of her work along with some fabulous secret family recipes. Thank you to my sister no. 1 for sharing with me her love of paint and to our Mother for keeping art in the family. Today we remember Martin Luther King. Many historians report that the legacy of Dr. King is being lost. I was fascinated to look up Dr. King's birthdate (January 15th) in the book "Colorstrology" and yes, "Leader" was one of the three words. Take a few minutes to remember MLK and look to your dream. Do not lose sight of your dream and let us honor MLK today. Take a look at this great little book, "colorstrology" and look up your birthdate and see what your birthday color says about you. Three words are listed that describe you and a brief description explains you and how your color will benefit you. The site is fun and easy to navigate. Walk down a snowy path. Breathe in the cold air and puff it back out like you smoke "camels." Listen to the winter wind, and the "sound of music" the animals make. Feel the snow beneath you, like a clean canvas for your feet to paint a pattern. Greet the branches along your way as they bow back at you. Look around and soak up the magic of nature. 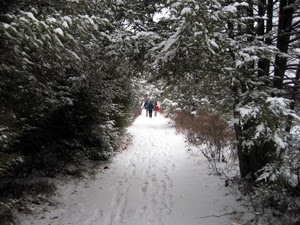 A walk can bring clarity to a creative project. Head back home and write or draw in your journal about your walk. The pages are blank and ready for your mind to wander freely. Create your own artistic path. How about a little "balminess" - certainly I could benefit from a bit of sun, warm air and some sort of concoction with one of those pretty little umbrellas. 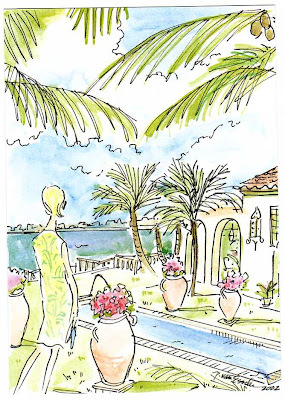 Many people live in tropical climates all year but I am truly more of a "Four Seasons" gal, so my little get-away is to draw a place I'd love to be. To feel my feet in the sand and to wear an open toe sandal in the middle of Winter, now that sounds like a last resort. My art has always provided me with my own little travel agency right at my fingers. I can be transported anywhere in a matter of minutes and there is "no bother" with any annoying airport security and alas, no wrinkles from too much sun. That said, I can always design and draw myself a brand new hat. Shall I reserve a lounge chair for you? I am wild about zebra and love this chic tunic. This is on my wish list and now I am seriously thinking that I will dust off the Singer and give it a go. Just yesterday, I opened a catalogue and there, right there was zebra! Eureka! Great minds think alike, after all "chic is where you find it." 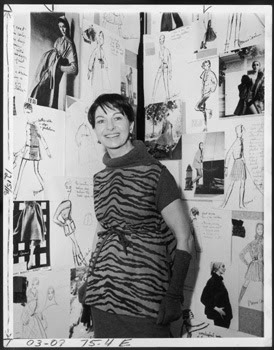 The above photo is Bonnie Cashin in her design studio. A girl after my own wild heart! Many of my clients admire the fact that I am a "quick sketch" and have mastered the ability to freely illustrate quickly. The thrill for me as an artist is to literally draw upon my vision and "get it out" with speed. Some of my best work has been done in such a fast and fluid way that I often feel it is just part of the process. Whenever I be-labour a drawing or get hung up on an idea it produces a forced result. That said, rushing is no good but setting up a deadline or a goal provides me a bit of steam to stay motivated to being an artist and working with a purpose. Unless I catch what is known as the dreaded "Artist's Virus" and that is when something out of your control interferes with your ability to draw and finish a project. I know that I am not alone, many writers as well as other artists say, they've come down with the "virus" and I can actually hear it in their voice. I guess the thrill of the speed of my craft is my sport. Another artist who loves speed is ski racer Tracie Max Sachs. She is known as the "Quick Chick" and flies down the mountain at speeds well over 100 miles per hour, setting the current record in the world for a woman's speed skier. I really love her red suit and my quick sketch is what I think I'd like my speed suit to look like. but I really can't hear them because I am in my own world. I wonder if her heart beats a little faster like mine does when I am flying around the paper with my pen or be it a brush. It is a rush for me! A looming deadline is ahead of me and I must be a quick sketch to cross the finish line. I wonder if quick chick ever catches the dreaded virus in pursuit of her craft. Love to hear all about what thrills you as you work towards crossing your own personal finish line. Do tell! 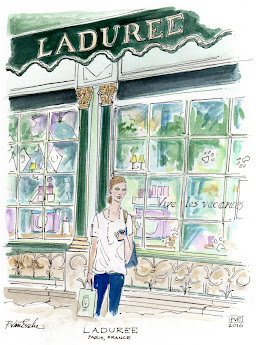 There is always "more in store" for me to illustrate and I absolutely love a good store. I do not discriminate, give me a great hardware store, a bakery, a shoe store, a mom and pop shop- and I will add whimsy and style to your favorite shop! Many of my clients love to see their shop in the form of art which is unique and original. The art is used for store mailers, a card, for advertisement, press kit, a web-site and or framed to cherish for years to come. Stores exist all over the world and virtual stores are a fun way to always find "more in store" while never even leaving the comfort of your very own home. 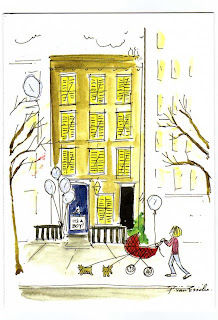 Besides it is always a treat to open an e-mail with your store sketch or even better the mail arriving at you door. Ardsley True Value Hardware for a can of paint or a new red wagon (above) This great store is located in Ardsley, NY - otherwise known as Mayberry RFD to some. A small village where everybody knows your name. "Joe" is the owner and he is a central part of the store, greeting clients with a smile and a song. By the way, he is an actor too. 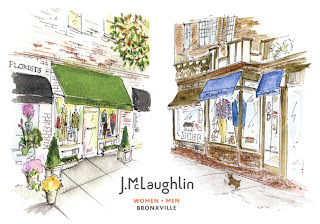 J.McLaughlin, for Ladies and Men's Fashion now has 40 plus stores. 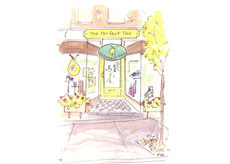 There were only 3 stores when I began illustrating for them. My how the J.McLaughlin family tree has grown. They are open all the time on line. The Perfect Pair for a new pair of shoes, a bag, a trinket to brighten your day. 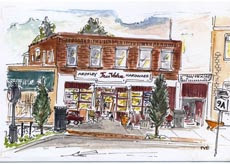 The shop is located in scenic Irvington, NY - right on Main Street. 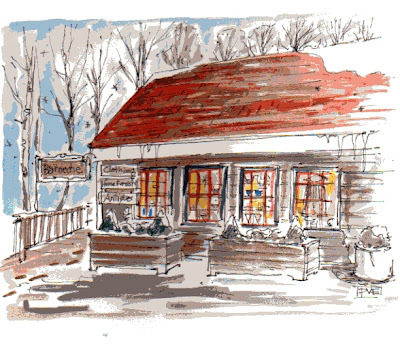 A charming spot to visit and take a stroll down to the Hudson River. Ask for the owner, her name is Patricia too. She is bubbly, energetic and if you want the job done, she is the one to call upon. Unique shops you will find and a stunning view of the Hudson too! One of my greatest pleasures are repeat clients who come back to tell me they will open another store. They are like children and each one is unique and lovely. I feel like my store illustrations are family heirlooms. 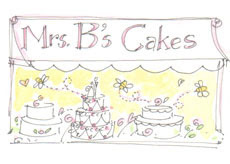 Mrs.B's Cakes, are baking all the time for you to order on-line for a special birthday or a wedding cake. Now we could all use a little cake and a cup of coffee, oh, silly me there is a store right down the lane. I'll meet you there with my paper and pen. Coming home has a special meaning to each and every one of us. A visit back to the childhood home, or simply returning home from a long walk to find things as we left them, gives comfort. Home illustrations are special to me, they represent a place of honor and one of memories, a new home, a new born, ear-marking an anniversary or just a gift to yourself! I work from photographs and never do the same house twice which makes each one original, unless you live nearby and would like me to come and "meet" your home. If you are looking for something with a personal touch, this is worth the wait as you see I have a "waiting list." Plus, I can renovate or landscape with-out all the head-ache. Need a fence or winter to be spring? After all, there really is no place like coming home, and of course "blogging" all about it. My menu consists of a blog "du jour" which I look forward to every day with unique flavor and originality right at my fingertips. One thing that my father taught me was to do something nice every day because you never know how that may help or change a life. It was more than just going t0 "church" - in his book, kindness was first and foremost, seconded by doing "all your best." He always tells me, "All you can do, is all your best, "Sug" (translation - "sugar") All the best 2007 was raised with the same values and she did a sweet thing, you see, she has my artwork as her blog masthead! In turn, I joined the blogosphere with much applause from all the best 2007. Little did she know that she would be a mentor as well as a muse. My favorite "blog du jour" shall continue as there are other incredible blogs who deserve a thank-you and a visit! Love to know your "blog du jour" on your menu of favorites. Weekends are a time to wander and to permit yourself to find a bit of pleasure. For some it may be sleeping late, spending your day in your pajamas or re-counting a dream, or losing yourself in a book. A dream of a book titled, "The Wanderer" has always been one of my personal favorites written by Alain-Fournier. One weekend, I wandered into a small shop of curiosities and was literally drawn to the cover which was illustrated by Edward Gorey. Picture a young boy cloaked in naive elegance, standing at the edge of the forest of adolescence. I knew at that moment it was a meant to be acquisition, indeed a rare and lucky find. This was the only book Fournier ever completed. " The Wanderer" was published in France in 1912 under the title "Le Grand Meaulnes." The first English and American editions appeared in 1928. Permit yourself to be a weekend wanderer. Indulge in a hot bath, a long walk, a spot of tea or an aperitif accompanied by a good book. Allow your mind to wander, after all it is the weekend! An artists prerequisite is to wander and in that quest, we are renewed. A wandering I go. Take time to stop and smell the flowers, especially the rose. The winner of the Derby not only sets his sight on the money but a bevy of beautiful roses. This is the only race which the jockey and his horse receives a garland of 564 hand picked roses as well as a "Jockey's Bouquet" with 60 long stemmed roses, plus a trophy. The payoff is the rush of two minutes of ecstasy and one big adrenaline rush to get to the finish line. Why that is less time than it takes to nurse a "mint-julep!" The thrill is the race. This oil painting is titled - "Run for the Roses" since I painted it as if I were running a race. My sweet reward is that they are still in full bloom all year, right down the lane at a bff's home. 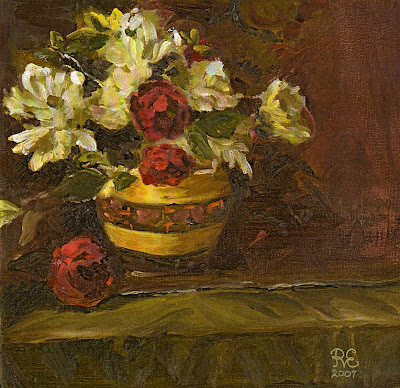 Roses and peonies as well as many other flowers inspire me as an artist, wife, mother, and friend. Is anyone getting the hint here? As my bff said, now you know "if they had a blog" - we'd be visiting it all the time! Pay a visit to one of my favorite florists, the dynamic mother-daughter duo, BelleFleurNY. They will even add mint to the arrangements, mint blends with floral fragrance and provides a sense of tranquility. Remember to stop and smell the roses. 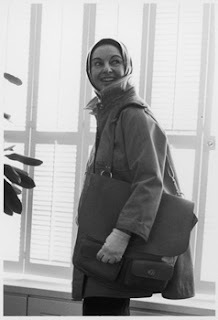 In 1960, she was approached by one of today's venerable institutions in the hand bag world and she declined as she told them she was too busy. They waited 2 years for her to join them and design a "Cashin Carry" line of colorful happy bags as well as accessories for COACH. Adore these happy illustrations. Note the practical hat. I'd love to know what's in her bag. No Cell phone, nope, no blackberry, no ipod, not even around then. That bag would look great today. She regarded her very own studio as a "secret laboratory" and traveled back and forth to work in Manhattan from one of the toniest Studios located near the United Nations. Her real inspiration came from the practical side of life. She lived right up the Hudson River and what's not to love about her sweet life and her closet which she called it her "boutique." That's what I call a "have." I have to have it. Open, organized, colorful, happy and practical. This gal was a pioneer in the "ready-to-wear" fashion world. Casual chic with a glamourous twist yet practical! Hats off to Bonnie for inspiring me every day. She looks so beautiful in this Hat. Perfect for a "box" seat on Derby Day or to block the sun. This is a gal with the haves. Does she remind you of anyone? She would be a "have" on my blog envy list if she were still here today. Horses love a good ranch just as we love a good home. Lucky me to get to draw some of the finest one's around! 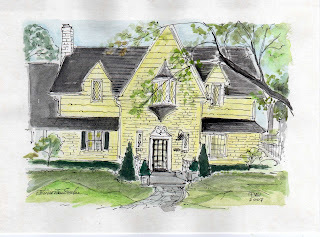 Here's a drawing of Mrs.Blandings "Butter yellow" Ranch. She remained calm and fearless in her pursuit of just the right color. In order for a Horse to give you their best foot forward, one needs to have no fear and to remain calm. I am speaking literally straight from the horse's mouth as when I was visiting my Uncle Earl on his property, he had a horse for his niece who rode and one day I was chased by that horse and he bit me on the back. I was not harmed as I had on a heavy coat. But he sensed my fear and showed me who was boss. A house has the same sort of sensory skill to hone in on your fears. To make it a home, one needs to be calm and remain fearless. We, the mothers of our ranch, literally know when we have created a fearless and peaceful stable. 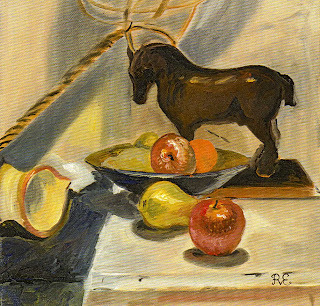 This is an oil painting, a still life, that I painted. Did you know that horses love apples and farmers love manure. Manure makes excellent fertilizer. Everything we grow, eat and then excrete goes back to the soil. Truly, everything is only borrowed. At the time when I painted this, I felt disappointed with my little painting. A disappointment like I had just stepped into something unfortunate. Alas, now I realize the importance of "manure"-Nothing is truly wasted. Even the things that smell or dissapoint us become fertilizer that will only help us to grow stronger. Back in the saddle again, the designer saddle that is. Mondays are a day to mount that saddle, pens in order, clean paper and water and fresh buckets of paints. After eating more than just a weekend diet of hay, and running wild, I am back to my"artful stable" and ready for my daily design regimen to commence. For years -many designers have been fascinated by the Equestrian Sport and graceful creature and perhaps the winning "purse" - for example the sought after Hermes bag. Designer Ralph Lauren (my alma mater of assistant design post) all look straight to the Horses mouth for inspiration, bit by bit. The sport of racing, polo or the art of Dressage have always appealed to the well bred and attracted the elite. The saddle is from Smith Worthington Saddlery Co., they have been making Saddles since 1794. Born and raised in the state of the "Derby", and growing up a stones throw from Rock Creek Riding Horse, I would love to visit the stable and smell that air of luxury. I would admire the saddle, the horse, the paddock, as well as the lucky riders to be able to afford to partake in such a moneyed sport. In the summer, I could here the organ playing as the riders were instructed to various commands of the MC at the Horse Show. The ribbons were even a marvel to me. That said, I never formally learned to really ride, but learned to draw I did. I was always taking art lessons, and creating and artful world around me- My mother made sure all 7 of us were never "bored" - just the way Eloise was never bored. Always something to draw, to paint, to sculpt, to sew, to bake or to play. My art teacher Mary-Louise Schrodt told me that I was wasting my time with all that other nonsense and art was my "horse" to reckon with. Black Beauty spoke to me too, you see that was a popular read when I was a girl. I always wanted a a "Dappled Grey" one. 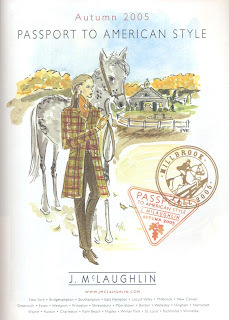 But I can draw one, and I did, for an advertisement for J.McLaughlin with a shop in Millbrook, NY (horse country) which graced the magazine "Quest." Guess, you can never take the Kentucky out of a girl nor the Horse from one of my inspirations to draw from. Even my web designer has ties to the Mustang, Mustang Web Designs yet another inspirational breed. Saddle up and enjoy your ride. might land in my soup! 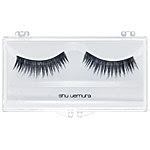 Then again, not a big investment to be found at Sephora, and they certainly would add to my wink factor. Give me a good bottle of black ink and a blank white paper and let the fear & fun begin. One totally intriguing illustrator who "cross-hatched" his way through life, lived in a macabre yet merry wrought iron little world. 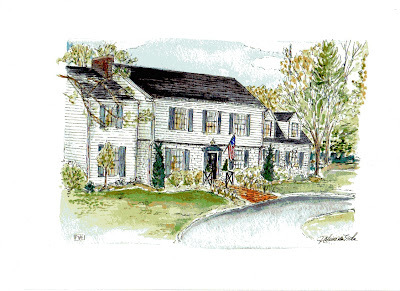 His home is open to the public, a home called "Elephant House" and is located just off Route 6A in Yarmouthport, MA. Perhaps the elephant that lived within were a mere collection of 45,000 books which obviously gave him creative fuel to literally burn that black midnight ink. Take a trip to Edward Gorey House. It's right on your way to Cape Cod. They say it was an ordered clutter, all those books and items from yard sales and then there were cats too. 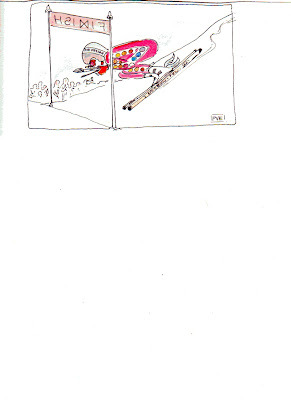 His unusual collection provided him to publish more than 70 books of drawings, starting in the fabulous fifties. I was fortunate enough to be given many signed books by a dear friend of mine who wanted me to keep them. Keep them I do, I have them all safely on a shelf and love to use them often, like good silver. What style, a unique drawing style with a mordant wit and taste for the macabre. Clever title," Goreopgraphy" - funny, they never offered that subject when I went to school. I would have signed up right away. His parents divorced when he was only 11 years old and then re-married years later. I can hardly imagine that. Edward Gorey attended Harvard which is another thing I could hardly imagine given the fact that my lack of math haunts me to this day. Rosy Lamb attended Harvard too, the one that sculpted "Clarice" - you remember her, her work haunts me the same way as this artist. Perhaps, there is some underlying message for me from both of these artists. Intrigue all from a bottle of ink or ball of clay. Perhaps the same intrigue I have, each time I face a blank paper, fear, with delight. You know what I am talking about, standing on the same line again for the roller coaster, the one that haunts me but makes me throw my head back and feel my heart The thrill of fear. That said, I must go finish an illustration for a pending engagement. Scared, a bit, but the thrill of the suspense is just killing me. Come in to this little red entry that I was commissioned to paint for a client. It reminds me of my days when I worked in "Thornbury's Toy Store" and "Red" was the number one color for that new Schwinn Bicycle, or Little Red Wagon. The store does not exist anymore but I still see the monkey on the red bike which was the store mascot. Red makes me smile. Nothing like red lips or nails to make people stop and take note. I wonder if that is what Red Riding Hood was really after, a little attention sporting her red hood. Historically speaking, red is also associated with royalty but to me it is one of the most playful in the palette. A dear friend only dressed her children in primary red, blue and yellow which to me sounded like a simple solution for entering into the world, confident, happy and ready for a good "Lego" play-date. Pink or soft blue pale by comparison. 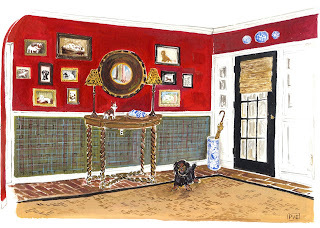 Red certainly provides a rich stage for the owner's framed canine collection. Nick, Knack, patty-whack, give a dog a bone and he'll come rolling home into a little red entry. Oh, by the way - the owner is a little red ruby of a client. She came back for more art and is acquiring a "black" chest to put in place of the table and to go in her little red entry. I'll be back with a post on, yes, you got it -"black!" I am an artist but never mastered sculpture. I still remember getting the red hard ball of clay in kindergarten and by the time it was even malleable, it was time to put it back in the Charlie Chip Can for the next visit. You could say, Sculpture haunts me. 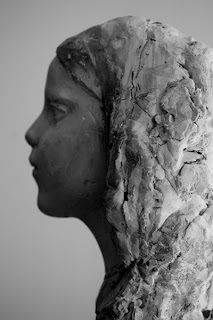 I find it intriguing that a sculpture can be formed from clay to an almost life-like image. Sculpture exudes the essence of one's soul. and so silent. Silence of the Rosy Lamb has no fear in my book.